Board certified in Neuromusculoskeletal Medicine and Osteopathic Manipulation, Dr. Hadley has spent the past 14 years as a private practice physician in Michigan and Colorado. Multiple hospitals and medical schools have called on his expertise to train their students, interns and residents. In the past he has served as an assistant clinical professor in the Osteopathic Manipulation Department at Michigan State University. Currently he holds the same position at LECOM, a college of Osteopathic Medicine in Bradenton, Florida. Passionate about providing the highest quality of care to his patients, Dr. Hadley continuously increases his knowledge and training by attending educational courses and by studying the latest advances in professional research. He has also demonstrated Osteopathic Manipulations usefulness in treating back and neck issues on cable T.V. 's Health Quest. In the office Dr. Hadley pays particular attention to your joints, bones, muscles and nerves. His philosophy embraces treating the patient as a whole functioning system and getting to the root cause of the problem. Dr. Hadley's goal is to get you on the path to feeling well again so you spend less time in his office! Dr. Hadley's background as a board certified Family Medicine Doctor adds to this holistic outlook. What Does Dr. Hadley Treat? Visit the Terms page for education on musculoskeletal conditions. Like an M.D., a D.O. is a fully trained physician licensed to prescribe drugs and perform surgery and can practice in any specialty of medicine. D.O. 's also use the same methods to diagnose and treat symptoms; however, they place a special emphasis on using manipulation to restore proper body alignment, strength and flexibility. What is Osteopathic Manipulation Treatment (OMT)? Dr. Hadley uses his hands and his knowledge of anatomy to diagnose problems in the muscle, skeletal, nerve and blood flow systems. Trained in more than 10 different types of Osteopathic Manipulation, he then puts things back into proper alignment using the appropriate manipulation techniques. Once aligned, nerves can stop being pinched, muscles relax and blood flow is often normalized so the body can heal itself. Chiropractors focus their attention on vertebral subluxations, or misalignment's of the spine, as the primary cause of problems in the body. In addition to correcting skeletal alignment, Dr. Hadley's use of OMT also manages care of the muscles, tendons, nerves and lymph/blood flow. As a fully licensed physician, Dr. Hadley prescribes medication and injections when appropriate to speed recovery. What can I expect during a typical office visit? 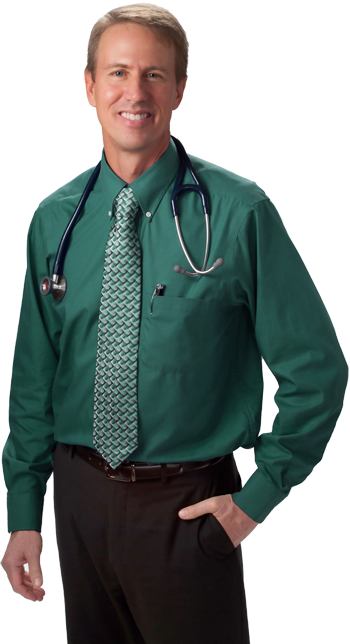 Dr. Hadley spends a lot of time with his patients performing a thorough history and physical. He reviews the current symptoms and then develops an appropriate treatment plan. If medically necessary, he will order X-rays, MRI’s or other diagnostic tests. Every situation is different. Some people feel immediate relief with just one treatment. The best results with OMT come from patients who have acute musculoskeletal pain (i.e. pain existing for 3 months or less). Most of these patients experience significant relief within four visits. If they do not, Dr. Hadley will often recommend further testing or a different approach to the situation. Dr. Hadley accepts United, Bluecross and many other plans. Click here for an updated list. Most plans pay for the office visit AND the manipulation treatment; others only pay for the office visit. Please check with your insurance company to verify what is covered. BMC Musculoskeletal Disorder Journal showed that OMT (Osteopathic Manipulation Treatment) significantly reduced low back pain when compared to placebo or normal back treatments. The benefit was noted not just for short term relief but also intermediate and long term relief. In addition it was noted that substantially less Osteopathic Manipulation Treatment visits were needed compared to Chiropractic treatments. "Osteopathic manipulative treatment for low back pain: A systematic review and meta-analysis of randomized controlled trials"
BMC Musculoskeletal Disorders 6: 43. Dr. Hadley is happy to answer any other questions you might have about Osteopathic Manipulation Treatment! Please visit the contact page and fill out the contact form to ask Dr. Hadley a question.